Seeking justice for all victims and their families. You can submit tips anonymously using our Crime Stoppers on-line tip system. If this is an urgent matter, do not submit it here alone. Either call Crime Stoppers or dial 911 if it is an emergency. Click here to view all cold cases for the last several decades. Open cases dating as far back as 1960. Click here to view or download all cards. 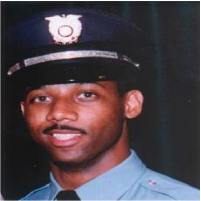 The Dayton Police Homicide Squad needs information regarding the violent shooting death of off-duty Dayton Police Officer Kevin Brame in late 1999. His grieving family still awaits justice following his brutal murder. On November 1, 1999, just after 9:00 pm, Kevin Brame parked his car in the driveway and returned his two small children to their home on Cherry Dr, in Dayton, Ohio. As Kevin returned to his vehicle, an unknown assailant emerged from a row of hedges near the house and shot him. Kevin was ambushed and never had a chance to defend himself. It is still unknown why Kevin Brame was killed. Anyone with information about this crime is encouraged to contact the Homicide Squad at (937) 333-7109 or by email: Patricia.Tackett@daytonohio.gov. The Cold Case unit is dedicated to the dignity of every homicide victim. Because of this, the units reviews all unsolved cases. Our goal is to provide answers for the families and protect the community by vigorously pursuing, apprehending and successfully prosecuting those who commit murder.